I had a couple of doctor appointments last week, the day after I received Saint Catherine Laboure / And Our Lady of the Miraculous Medal in the mail for a review. 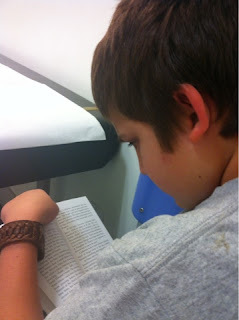 The book is geared for ages 9 - 12, so I was able to finish it while waiting for my appointments. I want to read it as a read aloud to the kids, but you can see that Nate picked it up and started reading it already! That, alone, is a strong recommendation for this book. The book tells the story of St. Catherine Laboure from her early childhood until her death. I thought the author, Sr. Marianne Lorraine Trouve, did an excellent job of sharing the details of her life in an easy-to-read story. The message of her humility, faith and hard work were strong throughout. 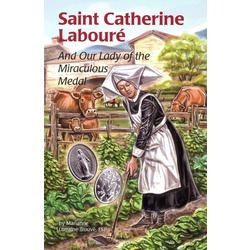 I have worn a miraculous medal for many years, and while I vaguely knew the story of St. Catherine, I learned quite a few details of her life from this book. One thing in the book that I really appreciated was the explanation that the medal is not a "good luck charm", but an "expression of faith." It is a reminder to us that when we pray to Mary for help, she prays for us to God. I think this is an excellent book for young readers. It provides detailed information about her life, and is a reminder to us all of the importance of hard work and humility in dealing with life. You can find the book at The Catholic Company's website.